Imagine waking up one morning, stumbling into the bathroom half asleep, turning on the tap to brush your teeth, and out comes seawater. Proximity to the Pacific is one of the perks of living in Orange County, but barring some bizarre decorating craze of the future, no one wants ocean water pumped into their bathroom. Jason Dadakis is part of the team at OCWD that protects our groundwater. How might that happen? Underneath the northern two thirds of Orange County lies a vast underground reservoir called an aquifer that supplies about 70% of the water the area drinks and uses every day. It’s under constant pressure from the ocean and a number of other threats. It is a treasure beneath our feet – one that has made Orange County and the SoCal lifestyle we enjoy here possible. The agency in charge of protecting that water so that we can use it is the Orange County Water District (or OCWD). OCWD’s Director of Health and Regulatory Affairs, Jason Dadakis, works on projects that ensure that water in the aquifer is clean and safe for us to drink. 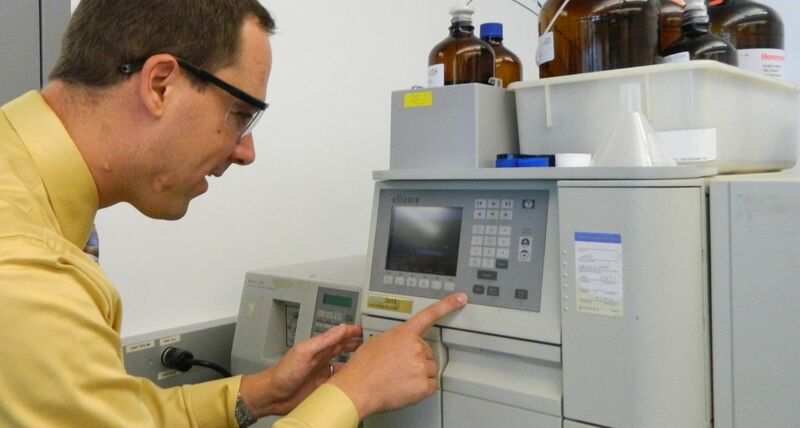 He works with staff at OCWD’s Advanced Water Quality Assurance Laboratory (AWQAL) that are responsible for testing the quality of local groundwater supplies. Dadakis lives in Fountain Valley with his wife and two young daughters. SoCalTap: Your house gets the water you test every day – do you and your family drink tap water at home? Jason Dadakis: Yes! It’s safe to drink. 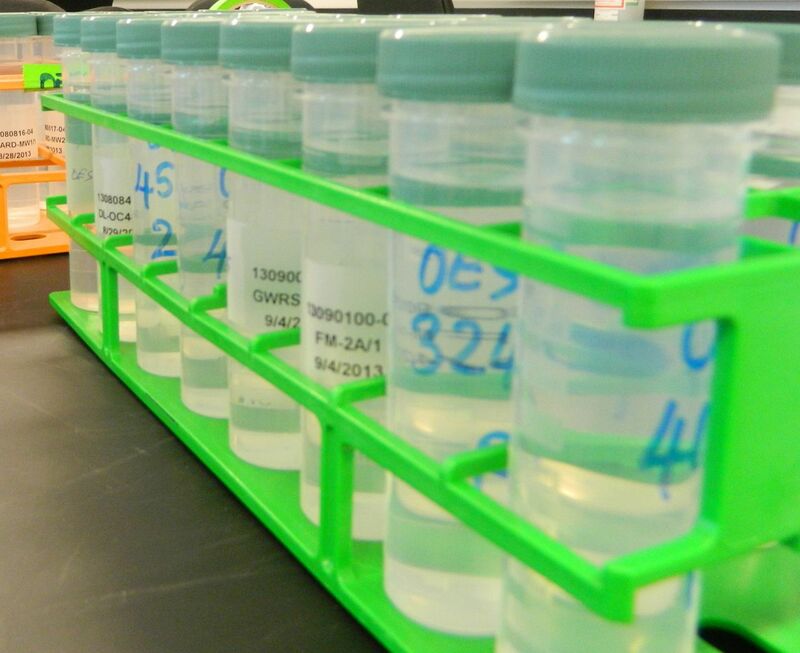 OCWD tests over 20,000 samples a year. SCT: What do you do to make sure that it is so safe? JD: Here in OCWD’s AWQAL facility, we test water daily to make sure that it meets the water quality standards set by the California Department of Public Health and the U.S. EPA. We analyze over 20,000 samples a year and report more than 400,000 results to those agencies. Added to that, we are going “above and beyond” to monitor for elements and chemicals that are not (yet) included in those standards. SCT: What types of chemicals are they? JD: Many of them are things we use regularly in our modern daily lives that eventually enter the environment. They include pharmaceuticals, personal care products, flame retardants, artificial sweeteners, and even herbicides. SCT: Why are we just finding out about many of these issues now? JD: They show up in very small “trace” amounts. We only recently developed the technology to reliably identify chemicals and compounds at those very low levels. For example, we can find an element equivalent to a single drop in 20 Olympic sized swimming pools – in scientific terms, that is “parts per trillion.” We can even go smaller and find parts per quadrillion in some cases. New technology is allowing us to find smaller and smaller traces of elements in our water. OCWD is proactive in monitoring these elements to ensure public safety. SCT: How are you addressing this issue? JD: Locally, we are working with other agencies in the Santa Ana Watershed on an Emerging Constituent Task Force. In the world of water, an emerging constituent is an element that is newly detectable, but not currently regulated. Our goal is to be proactive in maintaining the safety of the public, so we are continuing to go beyond what’s required of us to know what’s in the groundwater we manage. SCT: What does OCWD do to protect the groundwater basin as a whole? JD: We manage the Orange County groundwater basin to maintain and improve it as a sustainable local water supply. You can think of the groundwater basin like a bank account. Over the long term, we have to make sure that replenishment balances what the well owners pump out. The groundwater basin is like a bank account. We need to deposit what we withdraw. Credit: Irwandy Mazwir, Flickr Creative Commons, cropped. SCT: Why have an agency looking over it? Was there ever a time when people were pulling too much out? SCT: Why is the aquifer so important? JD: The ground is a reliable place to store water in Orange County. There is little room in a developed urban setting like this to build a surface reservoir. We are lucky to have the geology beneath our feet to store water. If the groundwater basin were to be continuously overdrawn it could cause our land to sink, in turn causing damage to buildings and roads. Additionally, we could lose the storage space permanently. SCT: Has that ever happened to a city? JD: Yes, the city of Venice in Italy is one example. They started pumping groundwater for industrial uses in the 1930s and by the ‘70s Venice started sinking. There are other contributing factors, of course, but pumping out too much groundwater has been shown to cause the land to sink. That’s particularly unfortunate for Venice, considering that it is already barely above sea level, especially with current projections for sea level rise in the future. SCT: So obviously, replenishing the groundwater basin is important. How does OCWD put water into the ground? SCT: What’s the cost difference between imported water and local ground water? JD: Groundwater is roughly one-third the cost of imported water. So the more groundwater our local cities can pump from the basin the greater the savings. By comparison, customers in areas that are heavily dependent on imported water pay much higher rates for their drinking water. SCT: What is your overall goal? JD: Our overall goal is to provide a safe and reliable source of groundwater at a reasonable cost and in a transparent manner. That encompasses everything we do, from our thorough testing of our groundwater to our Groundwater Replenishment System, which provides a secure supply of water at a reasonable cost. SCT: Thank you for your time, Jason.